Here at Scrap Car Network, we continually adapt our service to meet our customers needs. 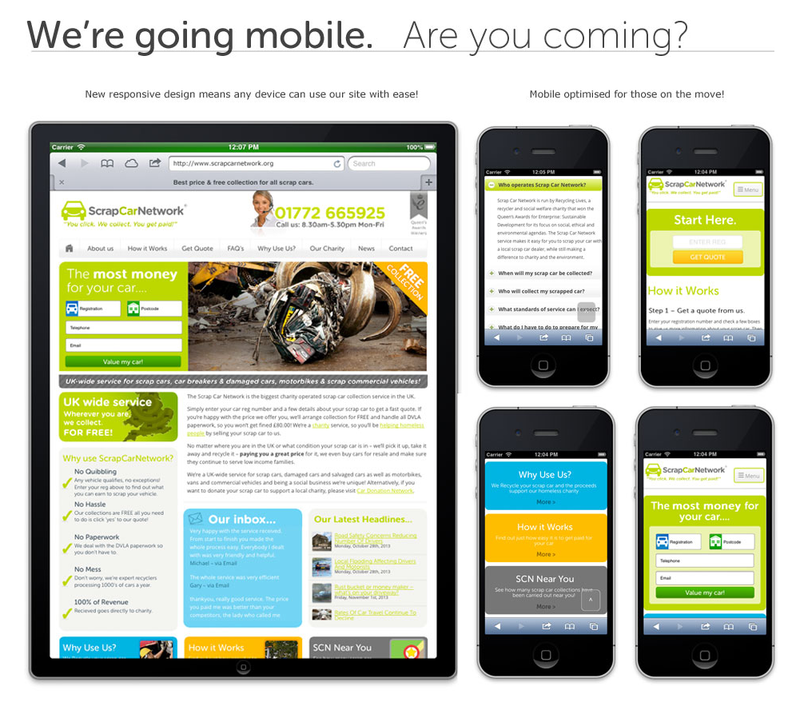 So when we noticed a rise in visitors accessing our website to receive a scrap car quote for their old or unwanted vehicles via mobile devices, we hurried into action to make access as easy and as user friendly as possible. And we are pleased to announce that Scrap Car Network is now mobile compatible; which means you can access us on the move, anywhere, anytime – even whilst in your vehicle (while safely parked, of course). These developments reflect our commitment to adapting and continuously improving customer service in accordance with the needs of our customers. Consciously prioritising excellence at every step of the customer experience, Scrap Car Network invests in our customers. As a Community Dotcom scheme operated by award-winning recycler and social welfare charity Recycling Lives, we also invest in the environment and local community – providing revenue going towards sustaining charity. This new data exposes the many sophisticated ways in which, as consumers, we view and receive data. The rise in visitors accessing the site using mobile devices reflects the increased pace of our time-poor society. Scrap Car Network’s online portal is the quick and easy solution for those short on time. We hope that our improvements mean that using our site is as user friendly and hassle-free as ever – and we still offer the same high quality service and great price for our customers. From a no-obligation quote for your unwanted vehicle to filling out DVLA paperwork, selling us your old scrap car means we do all the hard work for you! The team at Scrap Car Network take pride in accommodating customer wishes and ever-changing needs with free collection at a date and time of your choice by our nation wide collection partners. We’re a friendly and approachable bunch and we are only too happy to help. So if you wish to speak directly to one of our knowledgeable team of advisers, please give us a ring. And should you have any queries our frequently asked questions page is the one-click reassurance for PC and mobile device users alike. All hail the award winning, eco-friendly Renault Zoe!